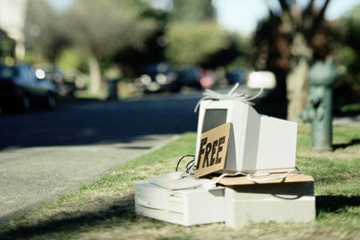 TECHNOLOGY-All That Matters Today: Are desktop computers Obsolete or Dead? Voila, I guess this is my fourth post in the same month. I would like to let all you people know that my blog has just completed an year on this world wide web. Recently I just wondered, if everything is on your mobile device, where the hell will today's desktop computers be seen tomorrow...! As far as I recall, ten years back from now,Internet was highly costly in India, charges for incoming call on mobiles were higher than the outgoing calls. Mobile phone was possessed by 1 of 100 people and computer was possessed by 1 of 1000 people. But with the advent of new technologies and the passage of time, computers have become a part and parcel of everyone's life. In such a scenario when mobiles are taking over computers in every aspect, what would be the future of desktop computers ever after 10 years or 20 years!!!. Lets dig in. Today everyone uses his mobile to stay connected, notebooks are used to gather and spread information, 99 of 100 people who use computers are the members of famous Social Networking websites, netbooks are available for computing on the fly. If everything has become so much into mobile computing, do you think the Desktop Computers will still serve human beings for long...? In search of an answer to this question, I just hunted down internet to gather some useful information. In recent time, with the arrival of new technologies and more efficient ways of fabricating transistors onto a silicon wafer, the advancement of the handheld device is at apex and still growing. The smartphones in 2006 had CPU speed of about 200Mhz whereas today's mobile devices are shipped with CPU speed of about 1Mhz. In fact the cost of LCD screens, which is the most costly part in an electronic device, are falling down. Costs of expensive parts of notebook computers are falling too. Notebooks, netbooks and tablet PC's are taking over the world. I still recall the start of my engineering days, when I had bought my first desktop computer when I was pursuing Computer Studies at the University of Pune, just for the reason I got desktop PC twice as fast as notebook just for one-third the price of notebook. Today for the same price I get a notebook computer which is twice as fast as my then Desktop PC. Netbooks, though slow in performance, are gaining popularity. The ubiquity of broadband Internet and the Cloud Computing model of computer usage have given a boost to the use of connected devices, mobile devices and hand-held devices. The theory behind Cloud Computing is that the Internet would, in essence, replace your computer's hard drive. Netbooks are so tied in with Internet access that telecommunication companies such as AT&T and Verizon have taken to selling them packaged with wireless Internet service. In 2009, 13.5 million netbooks were sold throughout the world. With the passage of time and following the Moore's Law, the number of transistors integrated onto a piece of silicon wafer has increased tremendously. This phenomenon has given rise to more and more smarter mobile devices. They not only help you to send and receive messages and calls, but they are now becoming the sources of information, primary ways of staying connected with friends, colleagues, companies etc. 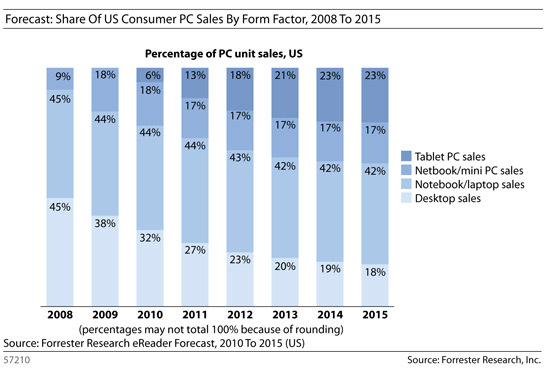 The Desktop computers are rapidly loosing grounds to the smartphones and mobile computing. The number of units of mobiles, netbooks, tablets that are manufature every month is increasing exponentially. The IP addresses in this world have exceeded the population count of the human beings on Earth and more mobile phones than Computers are being sold every minute. Lets see if the Desktop computers also walk the way Vacuum tubes and Transistor based computer went into demise.